Egypt Project: Gift of the Nile Tour - HISTORY'S HISTORIESYou are history. We are the future. For this project, you will explore Ancient Egypt and the Nile River valley as a tourist. I want you to imagine that you are on a two week holiday, floating down the Nile River in ancient times. During your travel, you’ll stop along the way to explore the cities of ancient Egypt, to take in the sights, to meet the people, and to live and work as the ancient Egyptians did. You will also keep a record of your experiences. Perhaps some of you have journaled during family vacations or at a sleep-over camp. I want you to think of your Egypt project as a travel journal. As you journey along the Nile and tour the surrounding area, I want you to create a journal that reflects your experiences. For a successful project, you will stretch your imagination and you will put yourself on the banks of the Nile beginning 5000 years ago. You will combine your imaginary wanderings with knowledge gained through independent research to create a journal that reflects your Egyptian experiences. The travel journal you make for your Egypt project will extend your research skills and add an additional creative layer that will allow you to both practice writing and reporting and will allow you room to demonstrate your artistic abilities. For this project, you must imagine that you are in ancient Egypt. While there, you must think of yourself as more than a passive observer. You must imagine you are also an active participant in Egypt’s ancient culture. In order to better understand what it was like to live at that time, you will conduct independent research on a variety of topics. In fact, you can think of your journal as a series of short research assignments. The more knowledge you have, the better job you will do making your imaginary experiences seem authentic. Over the next couple of weeks you will work with your fellow travelers to create a modern version of a travel journal, a travel blog. Within each broad category, you will have numerous options from which to choose your research topics. You can begin thinking about where you would like to go on your tour by reviewing a few ancient Egypt sites. I want you to think of your travel blog as a written record of your travel through ancient Egypt. It will contain information about the places you go- both the cities and the tourist sites, as well as the people you meet. Your blog should also serve as a scrapbook filled with mementos or souvenirs from your trip. In addition to your research-based writing, I expect you to include items such as travel maps, post cards, pictures, passport stamps, ticket stubs, etc. Remember, this journal should be a complete record of your travels through ancient Egypt. Please be creative! For a bit of inspiration, there are numerous, wonderful examples of travel blogs on the internet or here. One of your challenges is to think of creative ways to present the information that you discover about your topics. For your research in each of the four categories, there are numerous ways you might explore the topics you choose. For instance, since it’s a travel journal, you might present information about one of the cities and its tourist sites in the form of a letter home to a family member, or a friend, or yourself. Or, you might present your research in the form of an article that you cut out of a travel magazine while you were there. The creative side can be fun. Other creative ways to report your research might include picture postcards with images of one of the pharaohs on the front and a message to a friend on the back that contains important information about the pharaoh. For your research on four gods you may consider creating a deck of playing cards where the king of each card suit is represented by one of the gods. These are just a few creative possibilities. I’m sure you’ll think of many more interesting and fun ways to present your research. 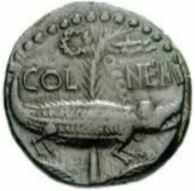 Gift of the Nile Crocodile Coin. ​On your "Gift of the Nile" tour you will be traveling and working together. Sometimes "togetherness" leads to bumps in the road. However, traveling in a group, whether it is with family, friends, sports teams, or school groups also has many rewards. You can always gain extra insights and perspective when you share the experience of travel with others. Group travel, however, often demands compromise, and it always demands cooperation and support to make it both an enjoyable and a successful trip. On your "Gift of the Nile" tour I want you to work especially hard at cooperation and compromise, to support each other with words and with deeds. You can do that by paying attention to the Project instructions, by asking for help when needed, and by offering assistance when requested. You have worked hard all year. On your "Gift of the Nile" tour your job is to spend money and have fun. You may choose as many traveling companions as you wish. The currency you will have to spend on your tour is the Crocodile Coin. I will start you out with 600 Crocodile Coins for every member in your tour group. 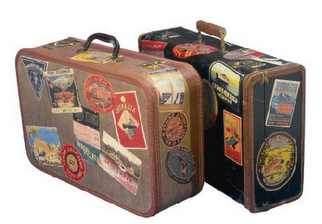 The success of your tour will depend on how much money you return home with at the end of the tour. Your job is to spend it all. Every city, tourist site, and souvenir has an admission or purchase price.​ Every person you meet will expect a gift. In order to spend all of your vacation money you need to visit quite a few sites or purchase a few souvenirs. Your project work - the posts you make on your travel blog - requires both research and creativity. 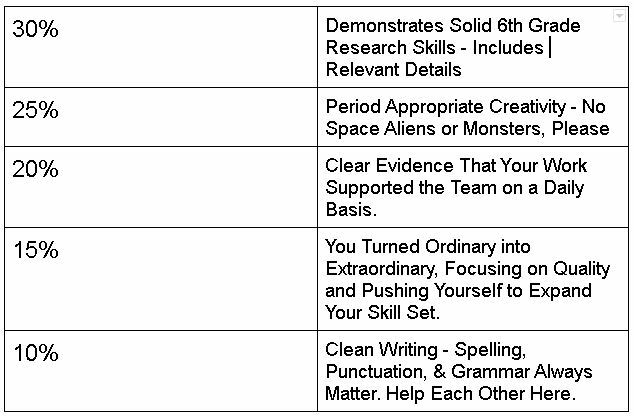 Please review the following grading factors and help one another achieve excellence.